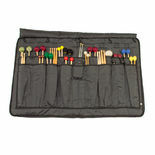 The Liberty One Tour Caddy Mallet Bag has 16 pockets to keep your concert sticks, timpani, keyboard, bass and gong mallets organized and ready to go. The closed dimensions are 18.5"x25" making this very easy to carry while the 35"x23" (open dimensions) offer lots of space. 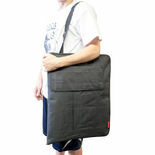 Two large velcro pockets are big enough to hold even oversize music. Unlike similar bags of this size, the Liberty One Series model 01M is constructed of durable water resistant nylon, for years of rainy day use! It attaches easily to the keyboard instrument of your choice, and comes with carrying handle and adjustable shoulder strap. This bag is similar to the Humes&Berg TX8006 and the Innovative MB3. This mallet bag looks great. The shoulder strap is comfortable, and the pockets are plenty large to carry any books you'll need. The bag however turned out to be remarkably huge. It's about two and a half composition notebooks wide and tall. Way larger than I expected, despite being given dimensions. This puppy holds all your mallets! I have had a cloth version of this bag for many years. Our local university percussion instructor had a smaller bag with a broken zipper so I got her this bag as an early Christmas present. 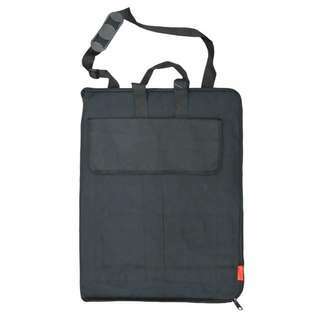 It really does a good job and the two large pockets are especially useful to hold music folders, small instruments and all the other stuff that percussionists end up carrying around. The only problem with this bag is that you can load it up so much that it is hard to lift and carry. Maybe it should come in a version with wheels? It's reliable and holds all of my mallets easily. This bag is awesome! Plenty of room for everything I need to carry, very well constructed. Fantastic bag for an inexpensive price. If you need something on short notice for your limited budget, I would recommend this bag.